Turmeric, Curcuma longa, is a tropical flowering perennial that falls within the same family as ginger and is one of the two rhizomes that have a similar appearance in shape as ginger. It’s cultivated and harvested for its roots, though its leaves are used in some food cultures. 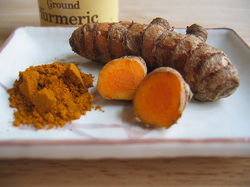 Turmeric root is the rhizome of the plant that is defined by abstract finger-shaped roots that have a ringed rough skin marked with knobs throughout. Its skin’s color is a combination of pale earth and orange. The flesh is a vibrant carrot orange color and its flavor warm and peppery with very distinct bitter undertones. It is most often boiled and then dried for powdered form, in which it achieves its trademark color.